Tag line: "How far would you go to become a hero?" OK...time to break out the Thesaurus. I'm gonna need a lot of superlatives for this one! Hero was director Zhang Yimou’s very first venture into the martial arts genre, but you'd never know it. This film makes him look like a seasoned pro. Stunning in every way a movie can be, Hero is flat-out awe-inspiring. In 3rd Century B.C. 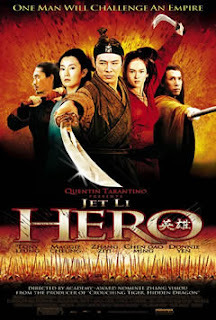 China, an unknown warrior (Jet Li) arrives at the palace of the King (Daoming Chen) to announce he's defeated the country's most notorious assassins, sending all to an early grave. These assassins; Sky (Donnie Yen), Snow (Maggie Cheung) and Broken Sword (Tony Leung Chiu Wai), have been the king’s enemies for some time, and he is pleased to hear they've finally been vanquished. But all is not as it appears, and his majesty may just have another enemy to deal with, one much closer to him than he realizes. Hero is an all-out attack on the senses, an amazing barrage of sights and sounds that never seems to end. To single out one specific moment from the film as ‘most spectacular’ would be an act of futility; the gorgeous images start within moments of the opening credits, and don't let up for a single second. Each time you think you’ve seen the most exhilarating battle, or the most picturesque locale, another comes along within minutes that starts your imagination to soaring all over again. Colors spill off the screen as if the edges of the frame lacked the strength to hold them back, yet in Hero, they do more than accent the movie's splendor. Director Zhang utilizes color to define emotion: sharp red for anger, deep blue for love, light green for serenity, bringing visual substance to that which is normally only felt. The story itself, which contains elements of political intrigue, love, deception, even war, is thoroughly engaging, and the action sequences are a ballet of activity so fulfilling, they’re nearly hypnotic. Bottom line? This is as impressive a motion picture as the cinema could ever hope to achieve. With Hero, Zhang Yimou has created a true work of art, and an experience that is unrivaled. Here is by far my favorite Martial Arts film of all time, even over Crouching Tiger Hidden Dragon. I feel that the music, cinematography, and performances were truly breathtaking.